418 pages | 326 B/W Illus. Lab-on-a-chip technology permits us to make many important discoveries that can only be observed at the microscale or the nanoscale. Using this technology, biological and biochemical analyses translate into greater sensitivity, more accurate results, and more valuable findings. Authored by one of the field’s pioneering researchers, Fundamentals of Microfluidics and Lab on a Chip for Biological Analysis and Discovery focuses on all key aspects of microfluidic lab-on-a-chip technologies to offer an exceptionally cohesive overview of the science, its limitations, breakthroughs made over the years, and currently emerging advances. The book emphasizes analytical applications of microfluidic technology and offers in-depth coverage of micromachining methods, microfluidic operations, chemical separations, sample preparation and injection methods, detection technology, and various chemical and biological analyses. Other topics of interest include the use of polymeric chips, fluid flow valve and control, single-cell analysis, DNA and RNA amplification techniques, DNA hybridization, immunoassays, and enzymatic assays. 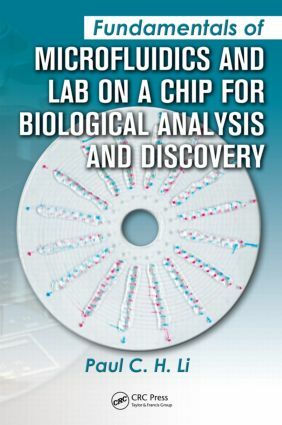 The book includes more than 300 figures that depict novel chip functions and breakthroughs and 16 tables summarize materials and refer readers to additional resources. An appendix compiles extensive analytical applications from emerging and established research groups. Beginners in the field will find the book useful for navigating the vast literature related to the technology, while experienced researchers will rely on the compiled information for easy comparison and references for further study. Derived from the highly popular Microfluidic Lab-on-a-Chip for Chemical and Biological Analysis and Discovery (2006), this volume is also readily adaptable for classroom use. Problem sets in each chapter help students test their assimilation of the material and clarify challenging concepts. The book contains a comprehensive glossary, a complete index, and extensive references. A solutions manual is available with qualifying course adoption. Dr. Paul Li obtained his M.Sc. and Ph.D on chemical sensors with Professor Michael Thompson at the University of Toronto in 1995. He then worked with Professor Jed Harrison at the University of Alberta during 1995-1996 in the field of microfluidic lab-on-a-chip. During 1996-1998, Dr. Li started his first independent research career at the City University of Hong Kong. After joining Simon Fraser University in 1999, Dr. Li continued to conduct research in the areas of microfluidics for single-cell analysis. He is the inventor of four granted patents and five pending patents. He is also involved in analyzing chemical compounds from herbs, especially those with antitumor properties. Dr. Li authored a monograph entitled Microfluidics lab-on- a-chip for chemical and biological analysis and discovery in 2006, and has co-authored a book chapter on microfluidic lab-on-a-chip in Ewing’s Analytical Instrumentation Handbook, 3rd edition, 2005.